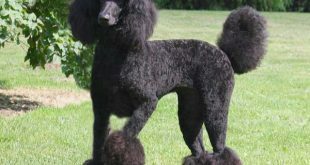 Do Poodles Bite a lot? 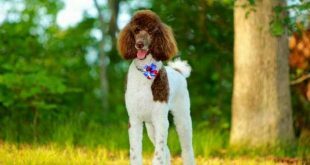 If you would like to know more about toy, miniature or standard poodle barking, you are at the right place. 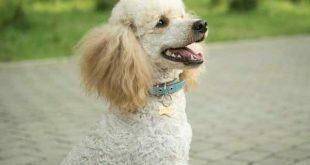 If you own a Poodle, you should be aware that your dog can bite for plenty of reasons, as it can be caused because of aggression, teething, even a defensive instinct. The breed is known for its biting habits, as this statement is completely legit. The reason behind this act hides under the actions and discipline the owner uses. From young age, Poodle puppies should know that chewing is not acceptable and it won’t be tolerated. If you don’t react fast, there is a chance that this biting can turn into a habit, which will affect your dog’s behavior and cause some serious issues later in its life. If your dog entered adulthood and is still biting, then you didn’t take any actions in order to prevent it. it is very important to teach your puppy from young age what is right and what is wrong for it to do. feeling some kind of pain. When there is something that drags its attention in a bad way, as it tries to notify it feels in danger. This is protection mechanism your dog uses in order to show that it has teeth and it is ready to use them if needed. It is very important for you to find the right method on time and use it to prevent unwanted acts in the future. If you see that this starts to become a habit, you should not neglect it. The signs you should look for the if your dog starts to develop the unwanted habit can be noticed with strange behavior that was not showed before, as the reason behind it can be medical issues. One of the most common problem is the one with the teeth, but this can be easily spotted. How your dog acts play a big role, so you should definitely pay attention to what your furry friend is up to. 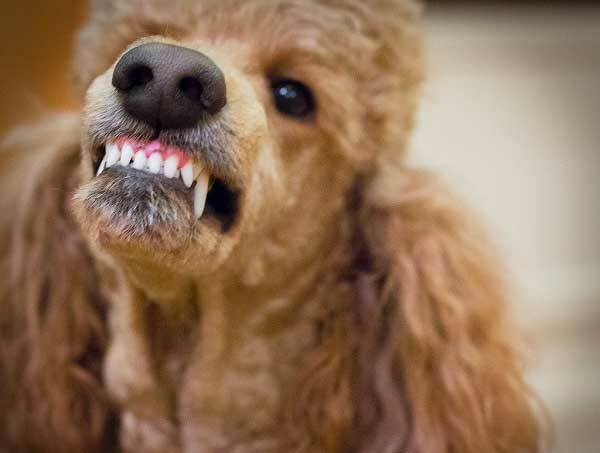 Biting is the method of your dog to notify you something is not right, as the reason can be pain or anxiety. The dog may feel threatened, and showing aggression and biting is its way of protection. One of the best explanations is that there is definitely a medical issue that occurs. If you approach its territory and try to touch it, it may attack if it doesn’t feel safe and in good health. There are times that the dog can even attack and bite its owners, if it feels extreme pain and disturbance. 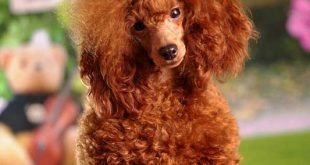 If the Poodle change its behavior and starts acting in a way it never did, then you should be concerned about its mental and physical health. Don’t ignore those signs and take care of the situation. As all of us are aware of, Poodles are very social, curious and attached to their toys, as they spend a lot of time playing and exploring. Dogs’ way to get to know our bodies is by using their teeth and mouths, as chewing our fingers and toes. This is a completely normal act when the puppy is still young, but when it starts to grow, things get very serious. You should try your best to teach your dog to put a limit on its mouthy behavior. You can use variety of methods, as it is the best for you to try the things that you feel most comfortable with. Your main mission is to teach your dog that biting and chewing people is not right. The key is to show the puppy that if they play rude and tough, they can hurt their loved ones while playing. Known as Bite inhibition, this is a term that shows the ability of the dog to control the force it uses with its mouth. There are many dogs out there that are not trained and do not have control on their bite force. Many specialists claim that a proper training will show that the dogs must be gentle while playing and don’t use force, which will affect the way they bite. This will prevent a lot of hard bites and broken skin. One great way to teach your dog is while it is socializing. Playing with other dogs will show your puppy how to have a good time without using force and hurting its friends. Games like wrestling and pouncing occur a lot of biting, and if the dog learns how to play without hurting, it will make the playing time even more satisfying. If your dog uses force, then its friend that was hurt it will run away, which will end the game, as your dog will realize its mistake and try to fix its action in the future. Those playing sessions are definitely the best way to teach your dog how to behave in a right way. It is good for you to show it what it is allowed, and what is the limit of its freedom. Letting your dog mouth on your hand can teach it how hard to bite, as once the dog starts to play tough, act like you are hurt and give a high-pitched yelp. This will startle the dog immediately and it will release your hand. If the yelping does not work, try with stern voice instead. Your dog must learn that it should respect its owner and if it acts rude and bad, it should apologies with licking. Use this type of training up to three times a day, as you don’t go over 15 minutes at once. Other pretty effective way is to switch to a time-out procedure if the previous methods does not show effect. Those time-outs are tested methods that will limit your dog’s mouthy behavior if it already entered adulthood. The first step is to show that you are hurt, as you yelp loud. Once your dog hears it, it will shock and distract it, as this is the right time to remove your hand. After doing this, act like you are not paying attention to it anymore, as if this doesn’t bother it and continues to mouthing, stand up and move somewhere else. After giving yourself the time-out, come back and show it that you want to play again. This is one smart move, with which you will show how to act gentle, and not play hard. Repeat the same situation, if your dog starts to bite again. Your dog will be smart enough to get the idea and start to show you it is ready for gentle play. Once this happens, you will be able to teach him how to behave right while playing, as the hard bites will be avoided. Be prepared with a toy to give your dog, if it starts to bite someone’s fingers. Training your dog and keeping its mind engaged will greatly help with its impulse control. Spoiling it with new toys to chew is a great way to show it that it is allowed to bite only toys. Socializing is the key. Playing more, going outside to explore and have a good time with its dog friend will guarantee for a successful completed mission. Last, but not least, always find time to play with your dog, and encourage it to do so, as you are its owner and you need to show it love and concern. Building strong relationship between both of you is something that should be a priority.